I have learned that it’s always a bad idea, but it’s a particularly bad idea when in a lonely place, for me to read depressing books at bedtime. Death? Check. (actual) Dismemberment? Check. Dead and/or missing children? Check! What was I thinking????? So one yard sale ($1 a bag) and one consignment shop later, I have a nice pile of books from which to choose something much better suited for reading before sleeping and dreaming. 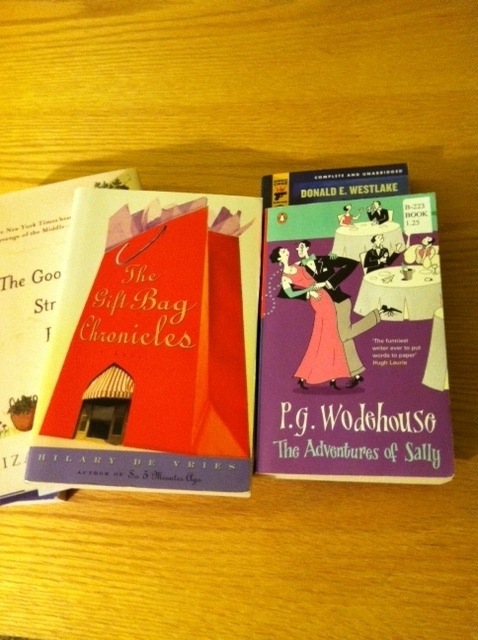 A Wodehouse, a Westlake, and a whole bunch of Chick Lit. Sweet dreams!